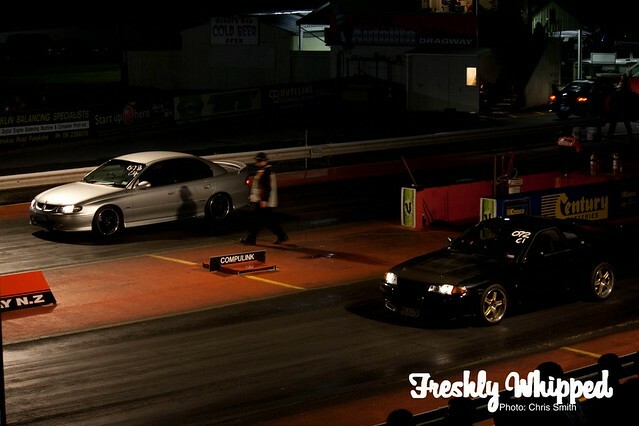 Night Speed Drag Wars is a chance for any car (as long as it’s road legal..) to get out on the drag strip and lay down some times. We see Japanese, Euro, American, Australian Cars, and Motorbikes. They have the choice to race one another, or race up against a time they’ve set. Since it’s called “Night Speed” it’s at night, starting at 6pm and onto 12am+. All of the cars racing at NSDW’s have to be inspected before racing. This shows a quick overview of the car to make sure it’s legal and not going to harm the driver easily.. I like this shot as I guess it’s ironic? This Mercury was one car that I never expected to see racing. For one I’ve never seen a Marauder in real life, let alone racing. Quite a rare find in NZ. 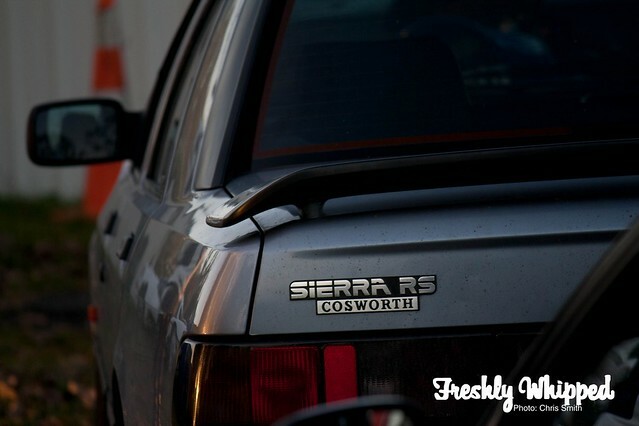 Another rare-ish car in NZ is the Sierra RS Cosworth. I’m a huge ran of these and it was great to see one out giving it a blast down the track. 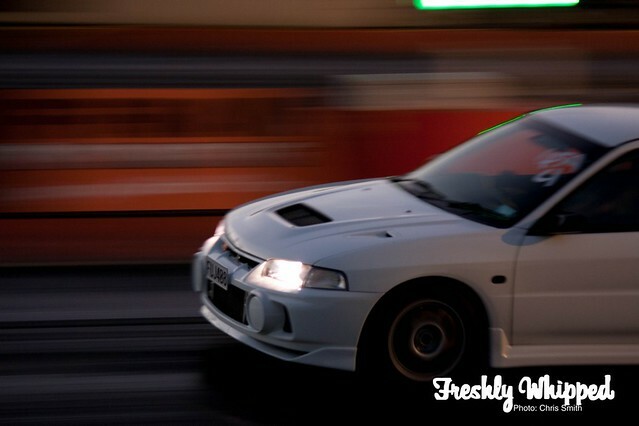 With sections such as the Turbo/4WD class, you see plenty of Evo’s and a few outliers. With many of the Evo’s appearing stock, it’s hard to tell which are more than your usual. This Evo however is definitely not stock. I had a chance to peer under the bonnet, only to see a giant turbo ready to demolish. The car itself is in no way stock, and is definitely one of my favourite cars of the night. 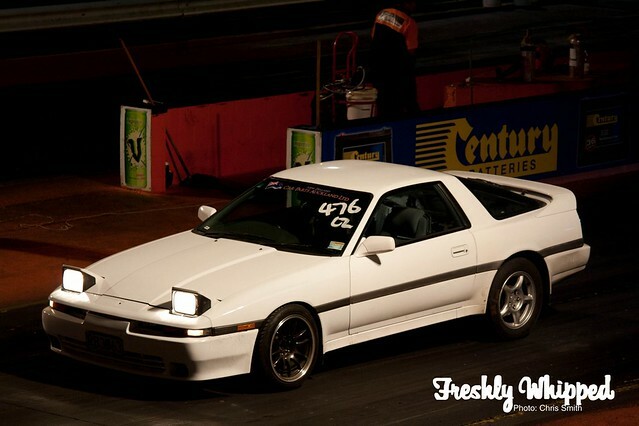 I really do love a classic Supra. It was great to see this one out racing. 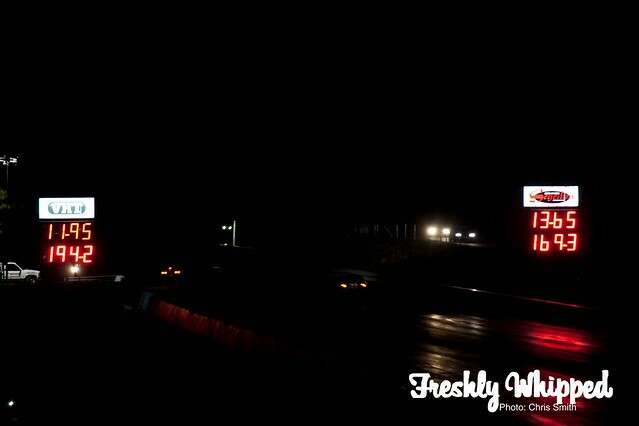 This R32 was looking great in the dark. 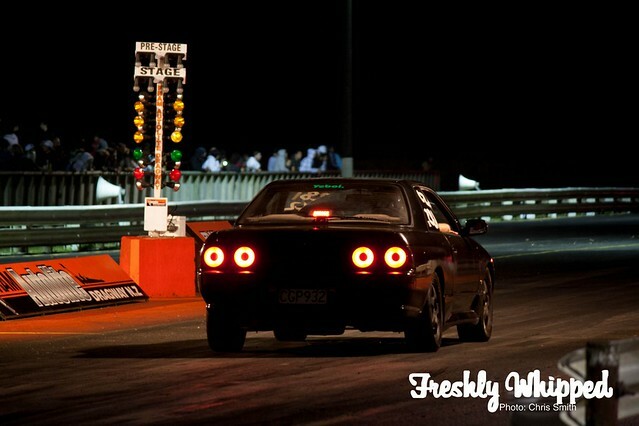 The dual tail lights glowing make this Skyline stand out easily. It’s hard to miss those tail lights. 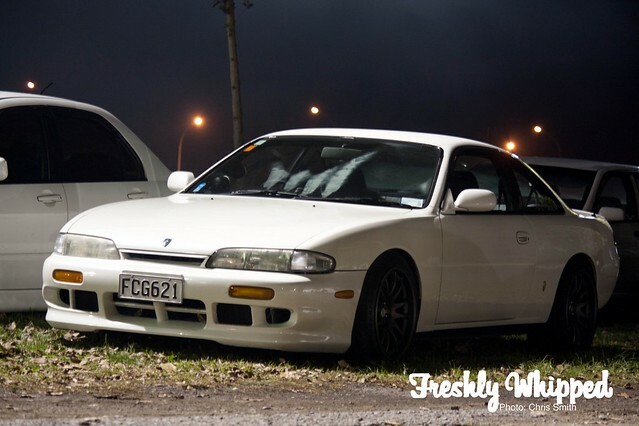 Out to the car park I saw this S14 parked up. I’ve seen this car at a few local meets recently and it never fails to impress. I think it goes great with keeping things simple. No massive bodykit, just clean fresh lines. 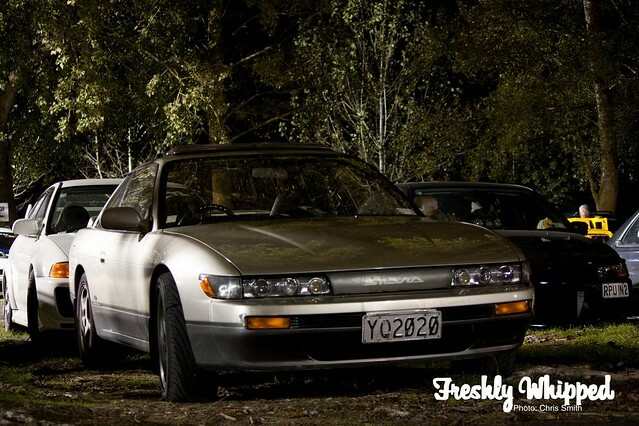 Speaking of Silvia’s, there was a few great examples of them. 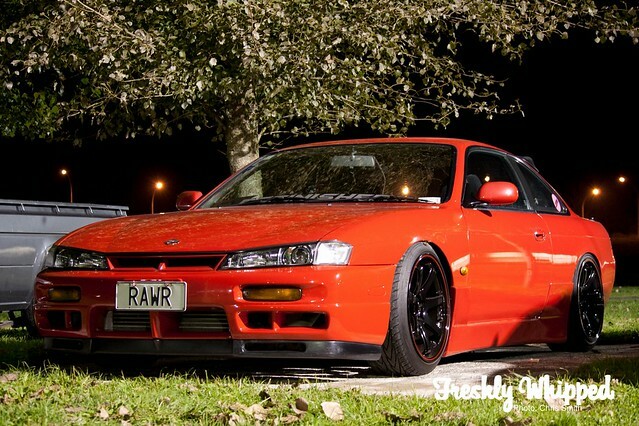 I loved this S14 with the Volk replica wheels. Another example of clean fresh lines. This also took my eye. I wish there was more of these Two-Tone Silvia’s left. They’re mean looking with the two-tone job. Great to see a Bathurst style race! …With the Skyline still coming out on top! 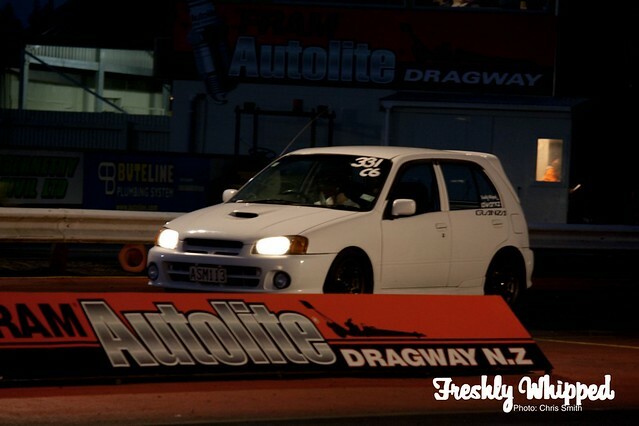 Our good friend Daniel was out racing his little Starlet. He’s been working on it for a while and no doubt will be getting quicker and quicker. 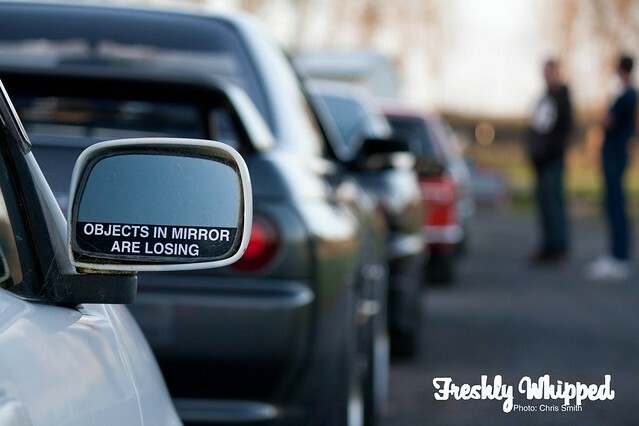 He’s rocking 2 of our white Freshly Whipped stickers on each rear window. The thing that scared me the most however was the bikes. Seeing these little rockets hit 10/11sec runs was amazing. 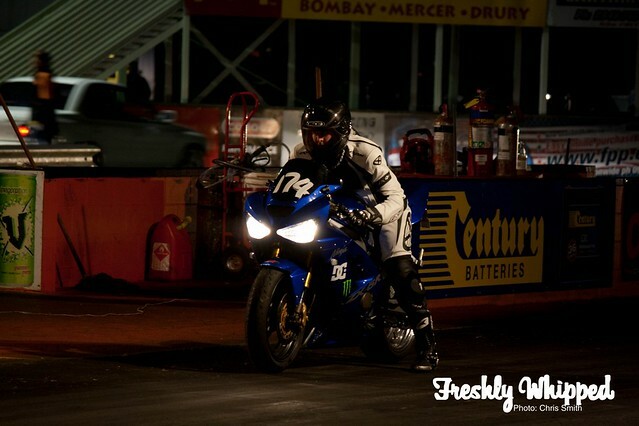 10 seconds in a car is scary, but on a bike it’s a near death wish. I have mad respect for those drivers. As the night came to an end my camera sadly showed its limits. Here’s hoping a new camera will be headed my way soon! 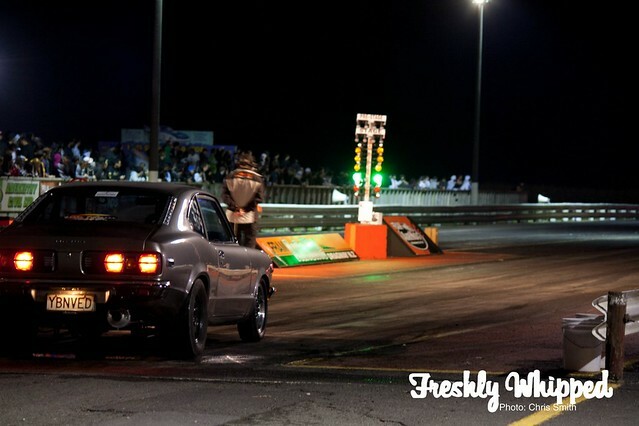 This RX3 however surely did know how to put on a show. You have to love the giant rear tyres on it. Some of these RX3′s were running very fast times. 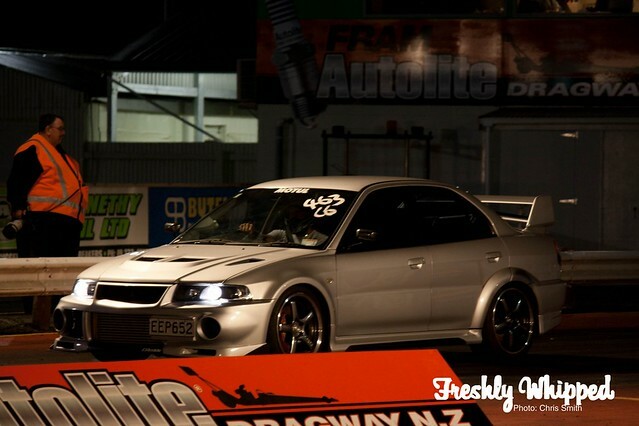 We definitely have a great Rotary culture in NZ. I promised my buddy here that I would put this photo up of him and his ride. Here you go man. All of the nights results are available here.